Puree all wet ingredients in blender. 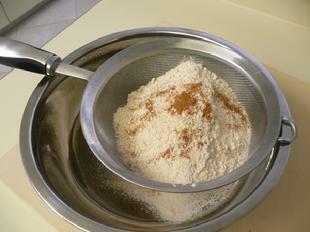 Pour liquid ingredients over dry ingredients. Add 1/2 cup of berries and walnuts. 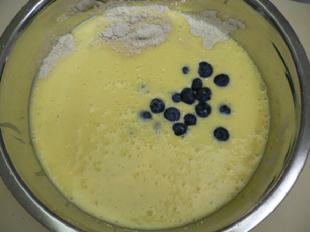 Do not over-mix the batter. 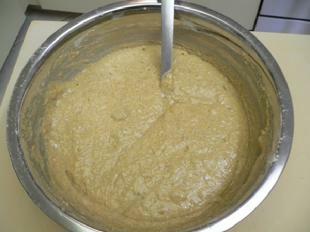 Batter is now ready for filling muffin tins. If using a non-stick pan you may wish to use a paper cup cake wrapper. Fill muffin cups half full with the batter. Add 4 to 6 blueberries, depending on size. Finish filling cups all the way to the top with batter. You may wish to garnish each muffin as seen below. This recipe will fill 12 muffin cups all the way to the top. Garnishing the muffin top is optional. 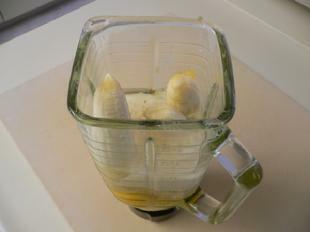 Slice a banana thin and place 2 slices on each muffin. Garnish with a couple blueberries. Place muffins into the oven on the middle rack. Bake muffins for 40 minutes. Remove from oven and let cool for half an hour. 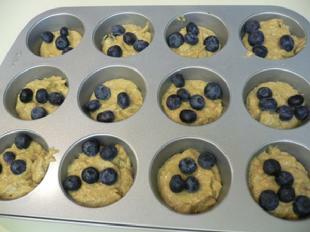 Remove muffins from tin and let cool another hour.. if you can. 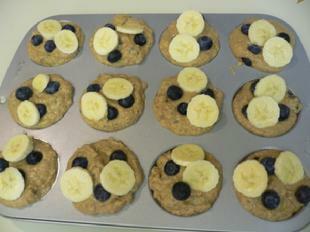 Making these muffins is a great activity to do with kids, yours or someone else's. I know how much kids like to bake cookies with a little help from an adult, as I have done it many times. 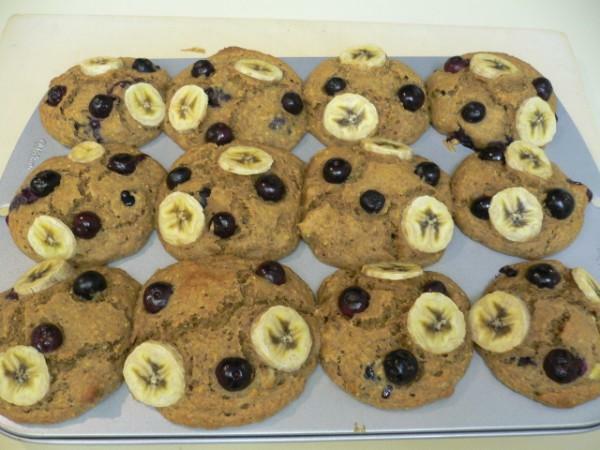 Why bother to teach them about creaming fat and sugar together when you can show them how to hide blueberries in the center of a muffin and put slices of banana on top! Teach older children how to make these muffins and let them come up with all sorts of interesting fillings like dried fruit, apples, strawberries, other nuts and so on.